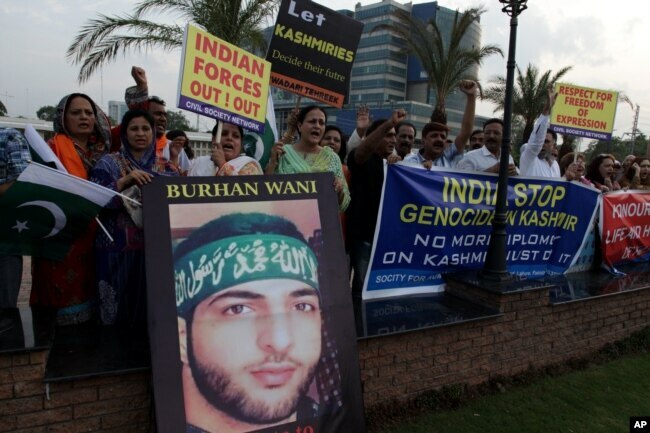 Srinagar, July 05 (KMS): In occupied Kashmir, the second martyrdom anniversary of the prominent Kashmiri youth leader, Burhan Muzaffar Wani will be observed on Sunday with the reaffirmation of the people’s determination that the freedom struggle will be continued till it reaches its logical conclusion. Call for the observance of the day has been given by the Joint Resistance Leadership comprising Syed Ali Gilani, Mirwaiz Umar Farooq and Muhammad Yasin Malik. The leadership appealed to the people to hold special prayers and fateha khawani, tomorrow, on Friday for Burhan Wani and those killed by the Indian troops during the mass uprising erupted after the killing of Burhan Wani on the 8th of July in 2016. Complete shutdown will be observed on Sunday and rich tributes will be paid to the Kashmiri martyrs. The JRL will hold a public meeting in Tral on that day. The leadership denounced the assertions of Indian Prime Minister Narendra Modi that Kashmir was a development and governance issue saying that Kashmir was a longstanding dispute that needed to be settled through right to self-determination. The occupation authorities slapped draconian law, Public Safety Act on three more youth from Islamabad district and shifted them to Kot Bhalwal Jail in Jammu. The Mirwaiz Umar Farooq-led Hurriyat forum in a statement expressed anger over the action. Grand Mufti Designate of occupied Kashmir, Mufti Nasir-ul-Islam in a statement thanked the UN Human Rights Council President Ambassador Vojislav Šuc over the release of the Council’s first-ever report on human rights situation in the occupied territory. Mufti Nasir-ul-Islam hoped that the report would be taken to its logical conclusion by laying the foundation for Human Rights Inquiry Commission in Jammu and Kashmir. The daughters of illegally detained Hurriyat leader, Shahid-ul-Islam through a letter warned that their father was facing a life threat in Tihar jail of New Delhi. Hurriyat leader Mushtaq-ul-Islam addressing the youth at several places in Badgam and Srinagar asked them to beware of the Indian conspiracies aimed at creating discord in the society. Meanwhile, Paris-based global media watchdog Reporters Without Borders in its first report on India noted that four more journalists were murdered in the country in less than six months in 2018. In Washington, the US-based satellite CNBC TV channel feared that Indian Prime Minister, Narendra Modi, might intensify crackdowns on youth in Jammu and Kashmir as part of his re-election campaign. Johannesburg-based Muslim Lawyers Association has lodged a complaint with the police calling for the arrest of Indian Prime Minister Narendra Modi when he visits South Africa in July for his crimes in occupied Kashmir.